Light a fire, pour a steaming cup of hot chocolate, and curl up with Country Faith Christmasthe holiday follow-up to Country Faith! Here you'll find 37 of America's favorite country music stars sharing their Christmas memories, personal recipes, family traditions and favorite Christmas carols in this beautiful, colorful ode to the season. 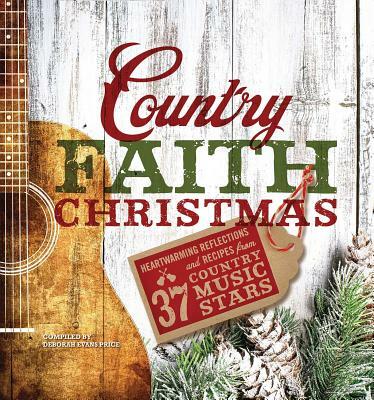 From Hunter Hayes, Florida Georgia Line, Lee Brice, and Reba to Scotty McCreery, Vince Gill, The Eli Young Band, and Brenda Lee, Country Faith Christmas features Christmas reflections from new and veteran artists. What's more, there's a Foreword by Kimberly Schlapman of Little Big Town, four Advent meditations from Charlie Daniels, a great recipe for smoked turkey from Dolly Parton, and the complete text of the Christmas story from Luke 2. You and your family will have everything you'll need to experience a joyous Christmas with Country Faith Christmas. Deborah Evans Price has covered country, gospel and rock music for Billboard magazine since 1994. She also contributes regularly to AOL's The Boot, Country Weekly, Gospel Music Channel.com, CMA Close Up, FIRST and other publications. A noted country and Christian musichistorian, she's authored The CMA Awards Vault, a history of the Country Music Association Awards published by Whitman Publishing as well as a historical retrospective on Word Records--"Word: Six Decades of Hits." Deborah has held editorial posts at Radio & Records, Country News, American Songwriter and Billboard. She has interviewed countless artists, including Willie Nelson, Amy Grant, Third Day, Don Henley, Bon Jovi, Chris Rice, Charlie Daniels, Kirk Franklin, 3 Doors Down, Sarah Brightman, Alan Jackson, Kenny Chesney, Smokey Robinson, Brad Paisley, Taylor Swift, Carrie Underwood, Steven Curtis Chapman, Sandra Bullock, and Robert Duvall. A respected music industry analyst, Deborah has been interviewed by key media outlets including MSNBC, CNN, the Today Show, ABC's Prime Time Live, the Gospel Music Channel, Country Music Television, The Washington Post and the New York Times, among others. She also served as a judge for three seasons on the nationally televised "Exalting Him: Christian Artist Talent Search." Deborah is on the Gospel Music Association's Board of Directors and is a 2002 graduate of Leadership Music. She resides on a hilltop south of Nashville with her husband, Gary, and son Trey.